In Commencement season, drudges in the press searching for good copy like to celebrate someone who overcame gargantuan obstacles to get a degree. Stepping back in time, Primus points to Charles Grandison Thomas, of the College class of 1838, who deserves a spot high in the pantheon of strivers. He was born in 1810 in the hamlet of Denmark, in the wild woods of upstate New York. His mother died when he was seven. He had no one to watch over him. Or, as he later wrote, he was “adrift in life, entirely destitute of the means of moral and intellectual improvement.” And destitute of funds. He began an odyssey that would bring him, through a triumph of resolve, to Harvard. Upon their graduation, his classmates made a Class Book, to which many contributed memoirs of their lives thus far. 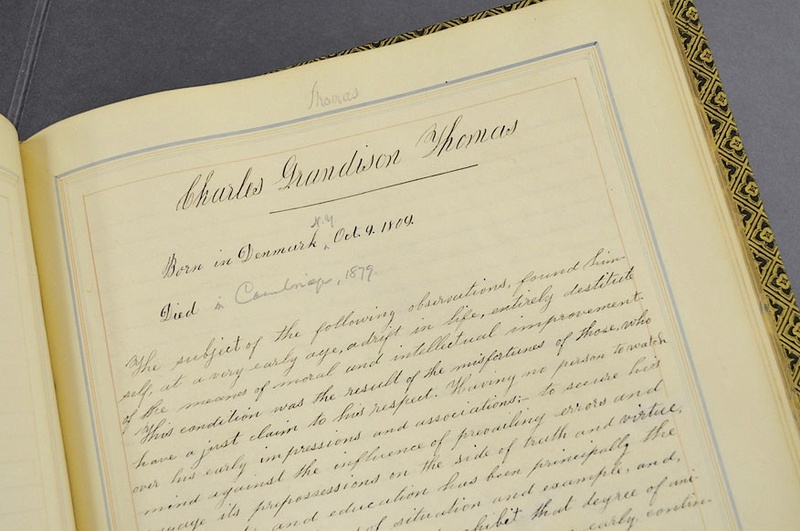 Brian A. Sullivan, former senior reference archivist at the Harvard Archives, came across Thomas’s contribution to that book (right) and transcribed it. The saga is now on this magazine’s website. Thomas earned a pittance at this or that, and ran away from his various masters when his situations became intolerable. In brief intervals, he had the chance to attend school or receive instruction from teachers in return for his pennies, learning geography and grammar with obsessive application. When he was 19, he was told that an older sister had died two years before on Martha’s Vineyard. To visit her grave, he went by steamboat to New York and wangled passage on a sloop to the island. He took up residence in a lighthouse in the sea near Edgartown as assistant keeper, a sometimes perilous position. “Here I lived almost entirely on bread and water at the rate of 40 or 50 cents per week, and attended as intensely as possible to my studies, for about three years.…Here I fitted for College.” He read Cicero. Ready at last, he thought, he sailed to Cambridge and was given a room at Harvard while he waited six weeks for an entrance examination. He was befriended by a benefactor he is careful not to name, who tutored him. He was admitted into the class of 1837. “I was almost totally ignorant of the correct pronunciation of the English language,” he writes. “And as to Latin and Greek my pronunciation in every recitation excited the laughter of my classmates.” He repeated his freshman year, joining the class of ’38. Thomas’s fellow students, many the languid sons of privilege, were kind to him, and though stern in visage, he was open and friendly to them. They called him “Lighthouse Thomas,” and “The Centurion” because of his weatherbeaten face. He wrote upon graduation, “my previous taste and habits determine me for the future to conceal myself in the obscurity of some populous city, and attend, with my wonted zeal, to the study and practice of law.” He earned an LL.B. from Harvard in 1841 and practiced admiralty law in Boston. He married Jennie Richardson in 1863. She died the next year after giving birth to a son, who followed her 15 months later. Thomas died in 1879 in Cambridge.